Mix together 1 cup sugar, margarine, add milk, vanilla, almond and egg. Divide dough in half; add 1/2 teaspoon red food coloring to one half of the dough. 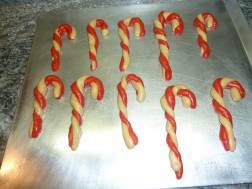 For each candy cane, shape one teaspoon of dough from each half (colored and not colored), into four inch ropes by rolling the dough back and forth on a floured surface. Place one red and one white rope side by side: press together lightly and twist. Curve the top of the cookie down to form the handle of the cane. Bake until set and very light brown, 9-12 minutes. Mix: 2 tablespoons finely crushed peppermint candies, 2 tablespoons sugar. Mix this together and sprinkle immediately over hot, baked cookies. looks sounds and tastes very good I love the cookie its my nephews favorite to leave out for santa on Christmas eve! !